b. to participate in Instant Win Games operated by Lottoland. These Terms and Conditions (https://www.lottoland.se/anvaendarvillkor) only apply to Players that are resident in Sweden. Lottoland is responsible for the operation of the Website, the Player Accounts, the placing and acceptance of Bets, the operation of Instant Win Games, taking Players’ Stakes and forwarding of Winnings to the Players within the scope of these Terms and Conditions. Lottoland acts as a bookmaker, determines the odds, calculates the Winnings and is responsible for the payment of Winnings and pays out the Winnings in Gibraltar. Through complex hedging measures and instruments (both financial instruments and the purchase of actual entries into the underlying lotteries), Lottoland guarantees the payout of all Winnings. Affiliated companies (e.g. EU Lotto) also conduct own lottery-style draws using the certified random number generator “RiNG”. a. When submitting a Bet on the outcome of draws of lotteries (conducted by official and/or state-run lotteries and/or by EU Lotto) or Financial Market data, Lottoland will act as a bookmaker for the Player. b. When ordering a Lottoland virtual Instant Win Game participation ("IWG participation"), Lottoland acts as IWG participation operator for the Player. At the time of registration or placement of an order, the Player enters a free contract with Lottoland in relation to the use of the Website, the set up and the management of their Player Account, the order of an IWG participation, the payment of the purchase price and the Winnings back to them. When participating in an Instant Win Game, the Player buys a chance of winning from Lottoland, the prizes for which are guaranteed by Lottoland. “Affiliated Company” – another company which is licensed to accept bets and has entered an agreement with Lottoland. EU Lotto is currently the only Affiliated Company. “Bank Card” – a prepaid, debit or credit card or any other card with a payment and/or credit function and used as a payment method. “Bet” – a bet on the outcome of a certain real event, for example the result of a certain lottery or Financial Market data at a set point in time, as offered by the Website and submitted directly or indirectly, via internet, telephone or other channels. “Betting Event” – the events Lottoland makes available to Players as described in the Lottoland game overview and on which Bets may be placed, including draws of Underlying Lotteries. “DoubleJackpot” – an additional option that a Player can select on the Virtual Play Slip which doubles the Player’s entitlement to a Jackpot. On one Virtual Play Slip, only either the option DoubleJackpot or NumberShield can be played. “EU Lotto” – EU Lotto Ltd, a company which is officially licenced by the Government of Gibraltar to accept Bets (licence number RGL 066) and to offer Casino-style products (licence number RGL 085). EU Lotto is also officially licensed by the UK Gambling Commission to offer Remote General Betting Standard - Real Event and Casino activities under licence number 38991. EU Lotto’s registered company number is 109514 (REID GICO 109514-83). „Excluded List“ - any person citizen of or resident in a country currently listed by the Financial Action Task Force as posing a risk to the international financial system, in February 2019 published at http://www.fatf-gafi.org/countries/#high-risk; any person listed on the financial sanctions list of HMRC, in February 2019 published at http://hmt-sanctions.s3.amazonaws.com/sanctionsconlist.htm; any person citizen of or resident in the United States of America. “Financial Market” – any recognised regulated stock exchange or market where buyers and sellers participate in the trade of financial assets and instruments such as equities, shares, bonds and currencies. "Instant Win Game" or "IWG" – a virtual, random number generator-based game offered and operated by Lottoland, e.g. casino-style games and scratchcards. “Jackpot” – in the case of a Bet, the maximum possible winning at Lottoland in respect to the relevant Prize Category/Prize Categories of the relevant Betting Event or the sum thereof without the option DoubleJackpot or, in the case of an Instant Win Game, the sum announced in the highest Prize Category. Jackpots can be fixed to an amount chosen and advertised by Lottoland. “Lottoland”– United Lottery Solutions Ltd., a company founded and incorporated with Companies House (registered company number 117131) and based in Gibraltar (registered office address: Office Suite A, Ocean Village Promenade). “Lottoland-SpecialJackpot” or “SpecialJackpot” – the highest possible win in the highest Prize Category (without activation of the feature “DoubleJackpot”) communicated by Lottoland in regards to a Lottoland game, if that sum is higher than the published jackpot of the relevant underlying lottery. “Lottoland Winning Bet” – a winning Bet for a Lottoland game, which was successfully submitted directly or indirectly, via Internet, telephone or other channels, and accepted by Lottoland in accordance with these Terms and Conditions, including possible winning Bets introduced through a third party to Affiliated Companies and then placed by a third party on behalf of the Player with the Affiliated Companies. “Pay Out” – the amount, which the Underlying Lottery Operator of a Lottoland game has to pay out or has already paid out in respect to a correctly matched Bet on a relevant Betting Event in a relevant Prize Category. “Prize Category” or “Prize Tier” – the amount of numbers correctly matched (including Super Numbers, Stars, Euro Numbers, Powerballs, Megaballs, Bonus Balls and/or others as applicable) determines the Prize Category in respect of the relevant Lottoland game, as announced in the official rules of the Underlying Lottery. “RiNG” – a random number generator used by EU Lotto to conduct lottery-style draws. The random number generator is compliant with the applicable regulatory model and standards. “Type A Prize Category” – a Prize Category where the payout to the player depends on the number of Lottoland Winning Bets and Underlying Lottery Winning Tickets in that Prize Category, as defined in the Lottoland Game overview. “Type B Prize Category” – a Prize Category where the payout to the player depends on the number of Lottoland Winning Bets and Underlying Lottery Winning Tickets in that Prize Category, as defined in the Lottoland Game overview. “Type C Prize Category” – a Prize Category where the payout to the player is independent from the number of Lottoland Winning Bets and Underlying Lottery Winning Tickets in that Prize Category, as defined in the Lottoland Game overview. “Underlying Lottery” – a lottery that an Lottoland game is based on or a lottery-style draw conducted by EU Lotto using the RiNG technology unless otherwise stated herein. “Underlying Lottery Jackpot” – the aggregate amount payable by the Underlying Lottery Operator in respect of all Underlying Lottery Winning Tickets in a Type A or Type B Prize Category in respect of the relevant draw of the Underlying Lottery, as announced by the Underlying Lottery Operator or, in a condition where no such Winning Tickets are announced, the amount that would have been payable by the Underlying Lottery Operator had there been a Underlying Lottery Winning Ticket in that Jackpot Prize Category in respect of the relevant draw. For Lottoland Games using the RiNG technology the amount is published on the Website. “United Lottery Solutions”– United Lottery Solutions Ltd., a company founded and incorporated with Companies House (registered company number xxxx) and based in Gibraltar (registered office address: Office Suite A, Ocean Village Promenade). “Website” – the Internet portal of Lottoland, which is accessible at www.lottoland.se, including joint or mobile Websites, which are operated by Lottoland within the same or another domain or within the same or another brand, any subdomains operated by Lottoland (*.lottoland.se) or top level domains as for example www.lottoland.se as well as iframes or comparable contents supplied by Lottoland within the Internet pages of third parties and any related mobile applications. “Winnings” – this refers to either the premium to be paid to the Player in respect of a Lottoland Winning Bet, or the prize paid out in case of a winning Instant Win Game. Unless the context clearly requires a different understanding, words used in one genus are to be understood in another genus as well. · they only have one Player Account at Lottoland. Lottoland is entitled to void a Bet or Instant Win Game at any time if the Player is found to be or have been in breach at any time of any of these warranties, (including, for the avoidance of doubt, even after a relevant Betting Event has taken place which would have entitled the Player to certain Winnings except for a breach of these warranties). The Player needs to register on the Website in order to use all services, place Bets or play an Instant Win Game. Lottoland reserves the right to refuse the completion of the registration for any person. The Player may be required to provide the following data in the course of registration, purchase or payout of Winnings: name, residential address, gender, date of birth, email address, telephone number, payment method data as well as other information relevant or necessary for the realisation of services provided by Lottoland. By providing this data the Player grants Lottoland permission to verify the data provided, including the verification of their age, directly through Lottoland or through specialised third party providers. Lottoland is not responsible for failure of payout due to non-provision of data by the Player, or the provision of missing, incorrect, incomplete or expired data. Lottoland is under no obligation to verify any data provided or to make contact with a Player to complete or change incorrect, incomplete or invalid data. The Player shall immediately inform Lottoland if their Bank Card or a comparable payment method, which they have specified on the Website, becomes lost, suspended or stolen; the same applies, if relevant passwords or confidential information has been submitted to third parties. Lottoland is entitled to request proof that a Player has authority to use any paying instrument which is linked to their account. The Player shall inform Lottoland about any changes with regards to information provided including, but not limited to Bank Cards and Bank Accounts, by updating their Player Account. Lottoland can not be held liable for any damages caused due to payment data being compromised. Players are not permitted to have more than one Player Account at any one time. If an additional account or accounts are or were opened by a Player and/or Payment details are used in multiple Player Acounts, Lottoland will be entitled in its sole discretion to close any such accounts without notice. Lottoland shall be entitled to void any bets made by that Player or to void any IWG participations of that Player. Lottoland shall be entitled in its sole discretion to define different minimum and maximum amounts for deposits and Stakes during a particular time period for a particular Player. It is the Players obligation to report suspected fraud or illicit use of their Player Account to Lottoland, and to take such steps as may be required in order to overcome it, such as by changing the password on the Player Account. The reopening of Player Accounts that have been self-excluded is only possible after the expiry of the Self-Exclusion period. For reopening their Player Account, Players must contact Lottoland’s Customer Service. The Player may close their Player Account permanently on the Website by using the facility My Account or by contacting the Lottoland Customer Service. The pre-condition for closing the Player Account is that there are no open or running Bets linked to the relevant Player Account. If the Player closes their Player Account and then opens a new Player Account, Lottoland shall have the right to close such new Player Account at its discretion and without any further explanation to the Player. The Player can see a list of all their active and expired Bets and Instant Win Games under the My Games section. A Bet is only considered accepted by Lottoland if the status of the play slip has the label "In Play" or a status with an identical meaning. The order receipt confirmation sent by email or the status "Submitted" or a status with an identical meaning only indicate that Lottoland has received the order for a Bet, not that it has been accepted. Only with a status like "In Play" in the overview the Bet is considered accepted. In case that a Bet is not accepted, Lottoland will refund the value of this Bet to the Player. The Player instructs Lottoland to accept Bets by filling out and submitting a Virtual Play Slip on the Website. The Player submits their Bet by clicking on the relevant button in the shopping cart. Where the account balance is not sufficient the Player needs to provide their payment details and Lottoland needs to get satisfactory confirmation of the payment before the Bet is submitted. Lottoland acknowledges receipt of the Player’s order by email. The Player may check the processing status of the relevant Bet at any time on the Website in their Player Account. Betting or playing with no account balance or with a negative account balance is not possible. The Player will receive Winnings equivalent to 100.000,00 EUR or more in a handover ceremony open to media of Lottoland’s choice and will give one or more interviews. The Player may still choose to stay anonymous. Lottoland may at its discretion waive these obligations and/or choose an alternative payment method if needed for operational or other reasons. For transfers, Lottoland may charge the Player with the fees for the bank transfer. With a direct debit order and authorisation respectively, the Player entitles Lottoland or its appointees the authorisation to debit the relevant amount from the Bank Account provided by the Player. In case of a returned direct debit Lottoland may reject the acceptance of further payments. Lottoland is entitled to transfer claims against a Player, including possible additional but appropriate fees to a collection agency. Any third party bank and payment processing charges and fees are borne by the Player and Lottoland is entitled to debit the Player Account accordingly. This also applies to foreign exchange charges. Lottoland will credit payments from Players to Lottoland’s bank account immediately upon receipt of funds. The Player has to state their player number with all bank transfers. In case a payment to Lottoland from a Player Account of a Player is ceased, interrupted, returned or for any other reasons not finalised or in case that such payment is cancelled afterwards or theft or fraud is obvious in this regard, Lottoland shall be entitled to debit the relevant amounts including possibly existing additional fees imposed to Lottoland. The Player can directly withdraw funds that constituted Winnings under the My Transactions section. In order to mitigate money laundering and fraud, funds from unspent deposits can only be withdrawn by contacting Customer Support. Under no circumstances will a Player be able to withdraw any bonus funds in their Player Account. A Player can only withdraw funds to a bank account in the name of the Player Account holder. The credited amount deposited by the Player and the payable credit balance on the Player Account respectively are held in a bank account in the name of Lottoland and are not subject to any particular escrow or mechanisms for protection in the event of insolvency. Lottoland is entitled to debit the Player Account with appropriate expenses which refer to the costs incurred by Lottoland because of the execution of assignments from a Player or the execution of an order. Winnings are tax-free or non-taxable in many countries. The Player is primarily responsible for correct payment of taxes, duties and levies. In the event that Lottoland is required to pay any taxes, duties or levies directly to the regulatory authorities of a country in respect of a Player’s winnings, then it shall be entitled to deduct those from the Player’s Account or claim them from the Player accordingly. Lottoland shall be entitled to deem a Player Account as inactive if more than one year has passed since the last stake transaction of the Player. Lottoland will notify the Player once their account is deemed as inactive. If the Player Account is still deemed as inactive 28 days after the notification, the Player’s claim to the account balance expires. Lottoland is entitled to use the account balance at their discretion including, and not exclusive of, a donation to a charitable organisation. Lottoland shall be entitled to suspend the relevant Player Accounts and Players from the use of the Website with immediate effect, if Lottoland believes that a Player does not or did not meet the requirements named in these Terms and Conditions. In addition, Lottoland shall be entitled to suspend the relevant Player Accounts and Players from the use of the Website, if Lottoland believes that: i. the Player has provided false or misleading information in connection with their Player Account, any payment methods or otherwise in connection with the Website and the services available through it; ii. the Player maintains or maintained more than one Player Account; iii. the Player is involved in any fraud-related activities; iv. the Player is or was in breach of any other substantial provision of these Terms and Conditions; v. the Player has used the Website in a fraudulent manner or for illegal and/or unlawful or improper purposes including but not limited to if Lottoland has reasonable suspicion that a Player is abusing or attempting to abuse a bonus, offer or other promotion form or taken advantage of any software or system bug or failure; vi. any of the events referred to in this clause may have occurred or are likely to occur; vii. required by law or if requested to do so by the police, by any regulatory authority or by court, in addition, Lottoland shall be entitled to suspend the relevant Player Accounts and Players from the use of the Website, if Lottoland believes that (i) any details of the Bank Account or Bank Card were, or have become, incorrect or the card is reported as lost or stolen or becomes the subject of fraud, (ii) Lottoland receives a negative appraisal of creditworthiness for a Player or any direct debit collection due from a Player is returned for reasons attributable to the Player, (iii) the Player has used a payment instrument without the owners approval; or (iv) the Player has allowed a third party to place Bets using their Player Account. During the period of any suspension of a Player Account the Player will be prevented from accessing or using their Player Account; in addition, Lottoland may investigate the event that gave rise to the suspension and Lottoland will be entitled (but shall not be obliged) to require that the relevant Player provides all such identification documents as Lottoland reasonably requires. Should Lottoland determine that the event giving rise to suspension has occurred, Lottoland will be entitled to terminate the Player Account in question permanently and may choose to do so once any outstanding Stakes associated with that Player Account for future Bets and/or Instant Win Games expire or otherwise may at its discretion void such Bets or any IWG participations issued or played. If the Stake was placed by a Player under 18 years of age, Lottoland shall void the relevant Bets and any IWG participations in which case the Stake will be returned from Lottoland to that person's Bank Account and the Player Account will be closed. Should Lottoland determine that such a breach has not occurred, the suspension of the Player Account will be brought to an end. If Lottoland terminates a Player's use of the Website for any other reason, Lottoland will notify the relevant Player by email using the email address provided to Lottoland. In such circumstances, Lottoland shall refund the payable balance held on the Player Account to the Player, after both stakes and any fees incurred have been deducted, and Winnings for all the future and open Bets and/or IWG participations that the Player has already purchased have been settled, using the Bank Account provided by the Player. Lottoland may withhold, delay or cancel any Winnings or Player’s funds from a Player if, Lottoland deems in its absolute discretion that (i) there may be chargebacks in respect of the relevant Player Account or between that Player and any affiliate of Lottoland, (ii) the Winnings stem directly from a chargeback or (iii) the Player has partaken in any form of bonus abuse, cheating, fraud or taken advantage of any software or system bug or failure. Players may inform themselves with respect to Winnings on their Player Accounts on the Website. In addition, Lottoland may inform the Player with respect to Winnings by email, SMS/text message or in other ways. Information about Winnings can be provided in any currency. Lottoland transfers the Winnings to the Player Account of the Player after publication of the relevant Pay Outs and calculation of Winnings. The Players are entitled to either use their Winnings to pay for future Bets and/or Instant Win Games or request that Lottoland pay Winnings into a bank account in accordance with clause 4.2. above. For safety reasons, Lottoland may transfer amounts to a Player’s Bank Account or other bank account nominated by a Player, given that it is in accordance with clause 4.2. above, only after a copy of the front and back side of a valid identification document, whose information fits the name or maiden name, date of birth and address the Player has provided in the process of registration, has been received and accepted. Lottoland is authorised to void the relevant Bets or Instant Win Games, if any of the following occur: (i) Lottoland was instructed by a Player to place Bets only after the relevant deadline or after the start of the relevant Betting Event and/or if Lottoland erroneously accepted an instruction to place Bets on the Website after the relevant deadline or after the start of the relevant Betting Event, (ii) Lottoland becomes aware of a genuine error in relation to that Bet or Betting Event and is not able to contact the Player to correct the error or confirm the Bet before the deadline, (iii) Lottoland was instructed to place a Bet or purchase an IWG participation by a Player who has provided false, incomplete or expired information in connection with their Player Account or otherwise in connection with the Website or the services available through it, (iv) Lottoland was instructed to place a Bet or purchase an IWG participation by a Player who has been involved in any fraud-related activities in relation to the Bet or Instant Win Game, the operation of the Player Account or otherwise in connection with the Website or the services available through it, (v) Lottoland was instructed to place a Bet or purchase an IWG participation by a Player who was, at the time of placing the Bet, less than 18 years old, (vi) the Player maintains or maintained more than one Player Account, (vii) in conjunction with any Betting Event or Random Number Generator user for Instant Win Games, fraud and/or technical and/or human error or unwarranted influence was found, (viii) the Betting Event is declared by an organiser or co-organiser as being invalid, incorrect or published in error, as the case may be, or (ix) Lottoland deems in its absolute discretion that a Player has partaken in any form of bonus abuse, cheating, fraud or taken advantage of any software or system bug or failure. Lottoland is only obliged to credit Winnings to a Player Account or comply with instructions from a player to pay Winnings into a bank account in accordance with clause 4.2. above if the Player is entitled to a Winning. For Winnings in any Prize Category or Instant Win Game, Lottoland may require additional documents such as certified copies of a proof of identity and address, regardless of whether such proof was provided to Lottoland previously. All requested and required documents must be provided by the Player no later than 12 weeks after the date of the Betting Event or the Winnings shall be forfeit. Lottoland reserves the right, i. to set off against a Player's Winnings the amount of any unpaid Bets or Instant Win Games owed by that Player to Lottoland or any affiliate; ii. to terminate, vary or suspend any Player Account, immediately and without prior notice, for any other reason at Lottoland’s sole discretion; and iii. to require that the relevant Player provide identification documents in order to enable Lottoland to satisfy itself as to the validity of Player Account details and the Player’s entitlement to the Winnings in accordance with these Terms and Conditions. Lottoland may withhold payment of Winnings until any such matter has been solved entirely. Lottoland reserves the right to make changes or corrections to, suspend or discontinue any aspect of the Website and the content or services or products available through it. Such changes shall not be applied retrospectively and in the event that such changes affect live Bets or Instant Win Games, Lottoland shall be entitled to void such Bets and/or Instant Win Games and the Stakes shall be repaid to the Player Account. Lottoland is not responsible for any promotional links or advertising banners of third party advertisers. Players must not misuse the Website by introducing viruses, trojans, worms, or other material that is malicious or harmful. Lottoland will not be liable for any loss or damage to Players caused by a distributed denial-of-service attack, viruses or other harmful material that may infect a Player's computer equipment, computer programs, data or other material while using the Website or any website linked to it. While Lottoland endeavours to ensure that the information on this Website is correct, Lottoland does not warrant the accuracy or completeness. The Website may contain errors or inaccuracies, or information that is out of date. The contents of this Website (including these Terms and Conditions) are protected by international copyright laws and other intellectual property rights. The owner of these rights is Lottoland, its affiliates or other third party licensors. All products and company names and logos mentioned on this Website are the trademarks, service marks or trading names of their respective owners, including Lottoland. Players are permitted to print and download extracts from this Website only for their personal reference, and only provided that i. no documents or related graphics on this Website are modified in any way; ii. no graphics on this Website are used separately from accompanying text; and iii. the status of Lottoland (and of identified contributors) as the author of any material on this Website is acknowledged. Other than as set out above, no part of this Website may be reproduced or stored, modified, copied, republished, uploaded, posted, transmitted or distributed, by any means or in any manner, or included in any other website or in any public or private electronic retrieval system or service including, but not limited to, text, graphics, video, messages, code and/or software without Lottoland’s express prior written consent. Lottoland will accept Bets placed with it by the Player, if instructions to place those Bets have been actioned by the Player. Lottoland is not a lottery operator. With Lottoland, Players are placing Bets on the results of the draws of official and/or state-run lotteries and/or lottery-style draws using the RiNG technology and/or on certain Financial Market data. At least one Bet per Virtual Play Slip has to be filled in. Every Bet is classified either as a separate Bet (“Normal Bet”) or as a combination of Bets (“System Bet”). In a System Bet, all possible combinations of the selected numbers are considered Normal Bets. Depending on the selected Lottoland game the Player may place a Bet for a certain duration (“Duration Bets”) and also extend the duration automatically (Subscription). Stakes for Duration Bets will be debited by pre-payment at the beginning of the relevant duration for all relevant Betting Events for the selected duration. The Player may automatically extend Bets by selecting the “Subscription” option. Depending on the selected Lottoland game the player may select a renewal period from 1 to 52 weeks. After this Subscription period has elapsed the Bets are renewed automatically for the selected period for withdrawal, if no notice of cancellation was received via the Player Account. The cancellation of a Subscription must be received by 23:59h of the day prior to the day the period for withdrawal ends. Stakes for following Duration Bets will be debited by pre-payment for every following period for withdrawal. By choosing the option “JackpotHunt” the Player may automatically extend the Virtual Play Slip until the Jackpot in respect to the underlying lottery of the relevant Lottoland game has been won. The period for withdrawal encloses only the next Betting Event date. The deadline for betting on a Betting Event will be posted on the Website. Valid Bets will be placed on the next relevant Betting Event that takes place, provided that they are placed before the respective deadline and provided that the Player has not selected something else on purpose. The deadline will be displayed on the Website. It is up to the Player to ensure that instructions are given to place the Bet before the relevant deadline. For the avoidance of doubt, instructions to place or the apparent placement of a Bet after the start of a specific Betting Event or a Betting Event that has actually occurred will not be valid, irrespective of any automatic confirmation, that may be generated via email or the Website, or irrespective of a wrong deadline displayed on the Website. The “When Jackpot is” feature will set Bets to enter/play a particular Lottoland game only if the announced jackpot for the Betting Event has reached or exceeded the specified “When Jackpot is” amount for the relevant Betting Event. If a lottery draw does not take place or no draw result is published or officially announced, all valid Bets on that Betting Event will stand for the rescheduled draw (or, if there is none, the next available relevant draw). Other than in respect of Daily Millions, in the event that not all Financial Market data required to determine the Betting Event winning number is available, the Financial Market data of the next day with all required Financial Market data being available will be used (example: there is no opening value due to a public holiday on Friday. In this case Monday’s opening values will be used). Other than in respect of Daily Millions, if Financial Market data of a day with an originally scheduled Betting Event is used for a previously scheduled Betting Event, the Financial Market data of the next day (with all required Financial Market data being available) will be used for that originally scheduled Betting Event (example: for a Betting Event originally scheduled for Wednesday and Friday there are no opening values for Wednesday and Thursday due to public holidays. In this case, Friday’s opening values will be used for the Betting Event originally scheduled for Wednesday and Monday’s opening values will be used for the Betting Event originally scheduled for Friday). This only applies to Betting Events of the same kind (Example: US Millions can use Friday’s opening values only once. If Friday’s opening values are used for the Betting Event originally scheduled for Wednesday, Monday’s opening values will be used for the Betting Event originally scheduled for Friday). With respect to Daily Millions only, in the event that not all Financial Market data required to determine the Betting Event winning number is available, the Betting Event will be moved to the next day with all required Financial Market data being available will be used with subsequent Betting Events being moved accordingly. Other than in respect of Daily Millions, in the event that any of the Financial Market opening values, required to determine the Betting Event winning number, matches the closing value of the previous day on which the Financial Market data was available, the Financial Market data of the next day on which all the required Financial Market data is available will be used (example: at least one of Friday’s opening values equals Thursday’s closing value. In this case Monday’s opening values will be used). With respect to Daily Millions only, in the event that any of the Financial Market opening values, required to determine the Betting Event winning number, matches the closing value of the previous day on which the Financial Market data was available, the Betting Event will be moved to the next day with all required Financial Market data being available with subsequent Betting Events being moved accordingly. Lottoland endeavours to ensure that all the jackpot values for Betting Events offered on the Website are correct, but assumes no responsibility for errors contained in such information. Lottoland estimates the amount of future jackpots using certain assumptions, such as the current or future jackpot being won or rolled over, but is not liable for false assumptions, calculations or forecasts. Instead of using financial instruments to guarantee the payout of the jackpots and Winnings offered on the Website, Lottoland may also purchase actual entries into underlying lotteries on behalf of the Player. Lottoland may require winners for such entries to collect prizes directly from the Underlying Lottery Operator. In the event that Winnings for such entries incur any taxes, duties or levies, these are to be borne by the Player. Under no circumstances Lottoland shall have any obligation to pay the Player an amount an Underlying Lottery Operator may fail to pay the Player in connection with any Winnings for such entries. The total of all Winnings payable by Lottoland per Prize Category for a certain Betting Event must never exceed the numbers as set out below. If it the numbers are exceeded, Winnings are divided among the winners. GlücksSpirale and GlücksSpirale GO: Monthly payments of 50,000.00 EUR or 4,800,000.00 EUR as the sum of all future monthly payments. For all games, Lottoland has the possibility to announce a SpecialJackpot under its sole discretion. In this case, the SpecialJackpot sum announced replaces any Underlying Lottery Jackpot in that Type A Prize Category. Only one Prize Category can be won per Normal Bet, which will be the highest of the available Prize Categories achieved by, and relevant to, that Bet. A System Bet can win in more than one Prize Category, based on the separate Bets it is made of. Example 1: There is an Lottoland Syndicate Winning Bet with Total Syndicate Winnings of 90,000,000.00 EUR. The Syndicate Fraction is 1 of 9. The Winnings for this Lottoland Syndicate Winning Bet are 10,000,000.00 EUR. Example 2: There is an Lottoland Syndicate Winning Bet with Total Syndicate Winnings of 30,000,000.00 EUR. The Syndicate Fraction is 3 of 25. The Winnings for this Lottoland Syndicate Winning Bet are 3,600,000.00 EUR. Winnings are calculated and credited in EUR. The exchange rate used is the European Central Bank Euro foreign exchange reference rate published for the relevant date on the ECB website or (if European Central Bank Euro foreign exchange rate is not available) the spot rate of exchange (the closing midpoint) for that currency into EUR on the respective draw date as published on oanda.com. This also applies for annuity payments. However, Lottoland may, in its sole discretion, chose to calculate and credit Winnings in the currency in which the Bet was placed. Lottoland will use reasonable endeavours to ensure that all displayed information and results on the Website are correct. Lottoland will not be liable for any mistakes in respect to the information displayed. Lottoland calculates the Winnings for each Bet. The calculation is different per Underlying Lottery and Prize Category, the following table "Lottoland Game Overview" explains how each Prize Category can be achieved and which calculation method applies for it. Sorteo Extraordinario de "El Niño"
The Winnings payable in respect of each Lottoland Winning Bet in a Type A Prize Category (as defined in the table in 11.1., for example Prize Category 1 in EuroMillions) will depend on the number of the Underlying Lottery Winning Tickets in that Prize Category, the number of Lottoland Winning Bets in that Prize Category, the payable Prize by the Underlying Lottery Operator for the Underlying Lottery Winning Tickets in that Prize Category as well as the Underlying Lottery Jackpot in that Prize Category. Lottoland calculates the Winnings in a Type A Prize Category on the basis of the amount of aggregate stakes published by the Underlying Lottery Operator as well as the distribution to that Jackpot Prize Category or on the basis of the jackpot published on the Website of the Underlying Lottery Operator for that Prize Category of the relevant draw of the Underlying Lottery. If the Lottoland Winning Bet in the Type A Prize Category is with DoubleJackpot, the Winnings are doubled. Example 1: There is only one Lottoland Winning Bet in the Type A Prize Category and no Underlying Lottery Winning Ticket has been announced by the Underlying Lottery Operator in the Type A Prize Category in respect of an Underlying Lottery Jackpot in the Type A Prize Category of 90,000,000.00 EUR. The Winnings payable in respect of that single Lottoland Winning Bet amount to 90,000,000.00 EUR. Example 2: There is only one Lottoland Winning Bet in the Type A Prize Category and two Underlying Lottery Winning Tickets have been announced by the Underlying Lottery Operator in the Type A Prize Category in respect of an Underlying Lottery Jackpot in the Type A Prize Category of 90,000,000.00 EUR. The Winnings payable in respect of that single Lottoland Winning Bet amount to 30,000,000.00 EUR. If there is more than one Lottoland Winning Bet in the Type A Prize Category, the Winnings payable in respect of the Lottoland Winning Bets in the Type A Prize Category without NumberShield are calculated based on a three-step calculation. Example 3: There are two Lottoland Winning Bets in the Type A Prize Category and one Underlying Lottery Winning Ticket has been announced by the Underlying Lottery Operator in the Type A Prize Category in respect of a Underlying Lottery Jackpot in the Type A Prize Category of 90,000,000.00 EUR. There are three payout shares, with a size of 30,000,000.00 EUR each. The Winnings payable in respect of each Lottoland Winning Bet in the Type A Prize Category amounts to 30,000,000.00 EUR. Winnings for Lottoland Winning Bets in the Type A Prize Category with NumberShield are calculated under the assumption that there had been no other Lottoland Winning Bets and no Underlying Lottery Winning Tickets in that Prize Category for the particular draw. Winnings for Lottoland Winning Bets with NumberShield are therefore not shared. The Winnings payable in respect of each Lottoland Winning Bet in a Type B Prize Category (as defined in the table in 11.1., for example Prize Category 2 in EuroMillions) will depend on the number of the Underlying Lottery Winning Tickets in that Prize Category, the number of Lottoland Winning Bets in that Prize Category, the payable Prize by the Underlying Lottery Operator for the Underlying Lottery Winning Tickets in that Prize Category as well as the Underlying Lottery Jackpot in that Prize Category. Lottoland calculates the Winnings in a Type B Prize Category on the basis of the amount of aggregate stakes published by the Underlying Lottery Operator as well as the distribution to that Jackpot Prize Category or on the basis of the jackpot published on the Website of the Underlying Lottery Operator for that Prize Category of the relevant draw of the Underlying Lottery. Example 1: There is only one Lottoland Winning Bet in a Type B Prize Category and no Underlying Lottery Winning Ticket has been announced by the Underlying Lottery Operator in that Type B Prize Category in respect of an Underlying Lottery Jackpot in a Type B Prize Category of 9,000,000.00 EUR. The Winnings payable in respect of that single Lottoland Winning Bet amount to 9,000,000.00 EUR. Example 2: There is only one Lottoland Winning Bet in a Type B Prize Category and two Underlying Lottery Winning Tickets have been announced by the Underlying Lottery Operator in that Type B Prize Category in respect of an Underlying Lottery Jackpot in a Type B Prize Category of 9,000,000.00 EUR. The Winnings payable in respect of that single Lottoland Winning Bet amount to 3,000,000.00 EUR. Example 4: There are two Lottoland Winning Bets in a Type B Prize Category and one Underlying Lottery Winning Ticket has been announced by the Underlying Lottery Operator in that Type B Prize Category in respect of an Underlying Lottery Jackpot in a Type B Prize Category of 3,000,000.00 EUR. There are three payout shares, with a size of 1,000,000 EUR each. The Winnings payable in respect of each Lottoland Winning Bet in that Prize Category amount to 1,000,000.00 EUR. The Winnings to be paid out in respect of each Lottoland Winning Bet in a Type C Prize Category (as defined in the table in 11.1., for example Prize Category 4 in EuroMillions) shall be the amount of the Prize announced by the Underlying Lottery Operator in respect of an Underlying Lottery Winning Ticket in the respective Prize Category. If the Underlying Lottery Operator has not announced a Prize in the respective Prize Category for the relevant draw of the Underlying Lottery, the Winnings payable in respect of each Lottoland Winning Bet in that Prize Category will be calculated on the basis of the aggregate amounts paid in for the relevant draw of the Underlying Lottery announced by the Underlying Lottery Operator and its allocation to the winning Prize Categories. The monthly payment shall not be paid for longer than 240 months, beginning the month after the relevant draw date. The entitlement to the monthly payment is not inheritable. As is common with MUSL Mega Millions and Powerball, Lottoland may also pay out the Winnings in Prize Category 1 over 30 years (the “Annuity Option”). If Lottoland chooses the Annuity Option, the first payment will be made as soon as possible after the draw, with the next 29 payments at one-year intervals. The level of payments is calculated such that the payments rise by the percentage set by MUSL from year to year until the full sum has been paid out. If Lottoland chooses the option to pay out Winnings in one lump sum (“Cash Option”), the Winnings after withholdings are discounted, as it is done in MUSL Mega Millions and Powerball. The discount rate is 40%, i.e. the lump sum is 60% of the Annuity Option value. It is in Lottoland’s discretion to choose the payout plan. Lottoland retains 38% withholdings of prizes in the highest three prize categories in MegaMillions and PowerBall because it is intended to put the Player in similar economic position as if they had played the underlying lottery. Lottoland retains 12% withholdings of prizes in the highest three prize categories in SuperEnalotto because it is intended to put the Player in similar economic position as if they had played the underlying lottery. Contrary to the provisions above, Winnings in Bitcoin Lottery, Cash4Life, Keno 24/7, KeNow, Saturday Jackpot, Summer Lottery, WorldMillions and all Lottoland Games based on the RiNG are paid out as published on the Website and independent of the Winnings published by the Underlying Lottery Operator (where this Underlying Lottery Operator is not Lottoland). Contrary to the provisions above, Winnings in Drömvinsten Plus, Lotto Plus, Millionaire Plus, Swedish Joker Plus, Swedish Lotto Plus 1 and Swedish Lotto Plus 2 are paid out as published on the Website. While the winning numbers for these games are taken from Loto Express, the number of Underlying Lottery Winning Tickets is taken from Svenska Spel’s “Drömvinsten”, Camelot’s “Lotto”, the official Euromillions, and Svenska Spel’s “Joker”, “Lotto 1” and “Lotto 2” respectively. Lottoland calculates the Winnings for each Bet. The calculation is different per Betting Event and Prize Category, the following table "Lottoland Game Overview" explains how each Prize Category can be achieved and which calculation method applies for it. The Winnings payable in respect of each Lottoland Winning Bet in a Type A Prize Category will depend on the number of Lottoland Winning Bets in that Prize Category and the applicable Jackpot in that Prize Category. 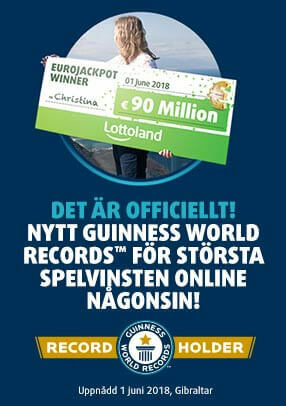 Example 1: There is only one Lottoland Winning Bet in the Type A Prize Category in respect of a Jackpot in the Type A Prize Category of 90,000,000.00 EUR. The Winnings payable in respect of that single Lottoland Winning Bet amount to 90,000,000.00 EUR. Example 2: There are three Lottoland Winning Bets in the Type A Prize Category in respect of a Jackpot in the Type A Prize Category of 90,000,000.00 EUR. There are three payout shares, with a size of 30,000,000.00 EUR each. The Winnings payable in respect of each Lottoland Winning Bet in the Type A Prize Category amount to 30,000,000.00 EUR. Winnings for Lottoland Winning Bets in the Type A Prize Category with NumberShield are calculated under the assumption that there had been no other Lottoland Winning Bets in that Prize Category for the particular draw. Winnings for Lottoland Winning Bets with NumberShield are therefore not shared. The Winnings payable in respect of each Lottoland Winning Bet in a Type B Prize Category will depend on the number of Lottoland Winning Bets in that Prize Category and the Jackpot in that Prize Category. Example 1: There is only one Lottoland Winning Bet in a Type B Prize Category and in respect of a Jackpot in a Type B Prize Category of 9,000,000.00 EUR. The Winnings payable in respect of that single Lottoland Winning Bet amount to 9,000,000.00 EUR. Example 2: There are three Lottoland Winning Bets in a Type B Prize Category in respect of a Jackpot in a Type B Prize Category of 3,000,000.00 EUR. There are three payout shares, with a size of 1,000,000 EUR each. The Winnings payable in respect of each Lottoland Winning Bet in that Prize Category amount to 1,000,000.00 EUR. The Winnings to be paid out in respect of each Lottoland Winning Bet in a Type C Prize Category shall be as displayed on the Website. Lottoland may pay out the Winnings in Prize Category 1 over 30 years (the “Annuity Option”). If Lottoland chooses the Annuity Option, the first payment will be made as soon as possible after the relevant Betting Event, with the next 29 payments at one-year intervals. The level of payments is calculated such that the payments rise by 5% until the full sum has been paid out. If Lottoland chooses the option to pay out Winnings in one lump sum (“Cash Option”), the Winnings are discounted. The discount rate is 40%, i.e. the lump sum is 60% of the Annuity Option value. It is in Lottoland’s discretion to choose the payout plan. Instant Win Games (IWG) allow Players to participate in virtual games offered by Lottoland on the Website, with winning numbers drawn by a certified and tested random number generator. Lottoland reserves the right to discontinue or to alter Instant Win Games formats, or add new Instant Win Games at its sole discretion, without providing reasons. Each Instant Win Game has a different Stake, different prizes and a different pay-out table. The pay-out tables of all the Instant Win Games are displayed on the Instant Win Game section of the Website. If a purchased IWG participation is not played within a two week period, Lottoland reserves the right to play the Instant Win Game on behalf of the Player. Any Winnings will be paid out to the Player Account. b. Lottoland shall not be responsible for any downtime, server disruptions, lagging, or any technical or political disturbance to the IWGs. In the event of a malfunction, all Instant Win Games are void. Refunds may be given solely at the discretion of Lottoland. c. The Player understands and acknowledges that if there is (or if the Player is later notified) that there is or has been a malfunction in an IWG or its interoperability, any Stake made during such malfunction shall be deemed invalid and the result, null and void, regardless of whether Winnings have been paid out. Winnings obtained by a Player in respect of a malfunctioning Instant Win Game shall remain the property of Lottoland. Any Stake from said Winnings played in any subsequent Instant Win Game round or rounds and the resulting shall also be deemed invalid and any result, null and void. The Player is obliged to return any Winnings obtained under this clause immediately to Lottoland, whether or not upon demand. d. To the fullest extent permitted by law, Lottoland disclaims all liability for any cost, expense loss, damage, claim and/or liability to the Player or any third party, howsoever arising, in relation to the Website or its content, or the Player’s use of the Website or participation in any Instant Win Game game; including without limitation, delays or interruptions in operation or transmission, loss or corruption of data, communication or lines failure, any person's misuse of the site or its content or any errors or omissions in content. In any case, Lottoland’s maximum liability arising out of or in connection with any of the foregoing events, whether in contract, tort, breach of warranty or otherwise, shall not exceed 100,00 EUR (one hundred Euro) in any particular instance. A Player is not entitled to claim any Winnings or receive a payout from Lottoland and/or Lottoland may at its discretion decide about the validity of a Bet, an Instant Win Game or a Player's entitlement to Winnings or void a Bet if i. Bets were placed after the relevant deadline or after the start of the relevant Betting Event; ii. Bets were erroneously accepted after the relevant deadline or if the relevant Betting Event had already begun or taken place; iii. Lottoland becomes aware of an error in relation to that Bet, a Betting Event or an Instant Win Game; iv. the Bet was placed on behalf of a Player or the Instant Win Game was played by a Player who has provided false information in connection with their Player Account or otherwise in connection with the Website or the services available through it; v. the Bet was placed on behalf of a Player or the Instant Win Game was played by a Player who has been involved in any fraud-related activities in relation to the placing of the Bet, the operation of the Player Account or otherwise in connection with the Website or the services available through it; vi. the Bet was placed on behalf of a Player or the Instant Win Game was played by a Player who was less than 18 years old or was a director, officer, or employee (or their spouse or dependant) of Lottoland or of one of the Lottoland Group companies; vii. the Player maintains more than one Player Account; viii. in conjunction with any Betting Event, fraud, technical and/or human error or unwarranted influence was found; or ix. the Betting Event is declared by the relevant organiser or operator as being invalid. Lottoland may claim back Winnings, that have been paid out already, from the Player where any of the circumstances referred to in 14.1 (i) - 14.1. (ix) arise. If any Bet or Instant Win Game is voided in accordance with 14.1. (i), (ii), or (iii), Lottoland will offer the Player the option of placing any such Bet on the next relevant Betting Event or crediting the Player's Player Account with the relevant sum. If any Bet or Instant Win Game is otherwise voided by Lottoland in accordance with this clause, the relevant sum associated with that Bet or Instant Win Game may be forfeited; or in the case where the Bet was placed by a Player who was under the age of 18 at the time of placing the Bet, the relevant sum will be returned to the Player. Lottoland reserves the right i. to set off against a Player's Winnings the amount of any unpaid Bets or Instant Win Games for Bets or Instant Win Games owed by that Player; ii. to terminate, vary or suspend any product offered on the Website, immediately and without prior notice, for any other reason at Lottoland’s sole discretion; iii. to pay Winnings partly or fully in instalments at Lottoland’s sole discretion and iv. to require that a Player provides identification documents in order to enable Lottoland to satisfy itself as to the validity of Player Account details and the Player's entitlement to the Winnings in accordance with these Terms and Conditions. Lottoland may withhold payment of Winnings until any such matter has been solved to Lottoland’s reasonable satisfaction. Lottoland decides about acceptance of a Player’s Bet prior to the beginning of the Betting Event. If Lottoland does not accept a Bet, Lottoland will offer the Player the option of placing any such Bet on the next relevant Betting Event. Lottoland’s complaints procedure has three levels. For level 1 to 3 the Player may contact Customer Service via email. Each correspondence shall be marked as “Complaint” and shall receive a reference number, provided that Lottoland has allocated a reference number to the relevant complaint. At level 1 the complaint will be dealt with by an employee from Customer Service. At level 2 the complaint will be dealt with by the Head of Customer Service. In level 3 the complaint will be dealt with by the legal department of Lottoland. In case the Player is not satisfied with the result of their complaint they may contact the Gibraltar Gambling Commissioner. In the event of a dispute in respect of a Bet or the payment or awarding of any Winnings, Lottoland may withhold payment of the Winnings until any dispute has been resolved to Lottoland’s reasonable satisfaction. Where Lottoland makes a final decision or exercises any discretion referred to above Lottoland may, solely at its discretion and notwithstanding Condition 15, reimburse the sum paid by the Player for the relevant Bet or Instant Win Game or offer a new Bet or Instant Win Game to the Player. Nothing in these Terms and Conditions affects Lottoland’s liability for cases of death and personal injury due to negligence of Lottoland. iii. the Website or its features and functionality are, or will be, compatible with, or available on, the device or system used by a Player to access the Website. In addition, Lottoland does not warrant that any alerts or advices a Player may choose to subscribe to will be provided in advance of the deadline for instructing Lottoland to place a Bet on the relevant Betting Event and shall have no liability to a Player if any such alerts or advices are incorrect or delayed or are not sent to or not received by the Player. Lottoland will use reasonable endeavours to ensure that the results and Winnings provided by it are correct. In spite of all endeavours for warranty of the accuracy of this information Lottoland shall have no liability for errors which are discovered only after Winnings have been paid out where such error is based on incorrect information that is published by a relevant publisher of that information relevant to those Winnings. Lottoland will not accept responsibility for loss or damage because of the insolvency of third parties, including banks maintaining the bank accounts of Lottoland. Lottoland shall not be liable for any loss or damage that may arise from the insolvency of third parties, including Lottoland or any bank, including (without limitation) any bank with which a third party supplier maintains their accounts. Lottoland is not obliged to pay Winnings if the Player has no such claim according to these Terms and Conditions. Any liability that Lottoland has towards a Player other than an obligation to pay Winnings to the Player for successful and valid Bets submitted and accepted by Lottoland according to these Terms and Conditions is limited, (i) in the case that the liability refers to a Bet: to the total amount of the Player’s Stake in regards to that specific Bet and (ii) in all other cases: to the amount of 5,000.00 EUR (five thousand Euro). Lottoland regards the agreement and its components as appropriate and fair. Lottoland does not separately file the individual terms entered into by Players when they register or play on the Website. Players can access these Terms and Conditions on the Website. Players can make a durable copy of these terms by printing and/or saving a downloaded copy on their own computer. All transactions including the payment of Winnings whether contractual or otherwise between Players and Lottoland shall be deemed to be concluded and to take place in Gibraltar where Lottoland's servers are located. These Terms and Conditions, the relationship between Players and Lottoland and each Bet and each Instant Win Game shall be governed by and construed in accordance with the laws of Gibraltar. Each Bet is placed and received and each Instant Win Game is played in Gibraltar. Internet gambling may be illegal in some jurisdictions or its legality may be in doubt. Each Player acknowledges and accepts that Lottoland cannot and does not give any legal advice or assurances or make any representation of any kind in respect of the legality of using their services in the jurisdiction where Players reside or are located. Lottoland will not be liable for any illegal or unauthorised use of the Website or their respective services. All promotions, bonuses or special offers are subject to these Terms and Conditions and any promotion-specific terms and conditions which Lottoland may introduce from time to time in conjunction therewith. In case of a conflict between these Terms and Conditions and the promotion-specific terms and conditions, these Terms and Conditions will always take precedence over the promotion-specific terms and conditions. These Terms and Conditions and the promotion-specific terms and conditions override any contrary statements made by Lottoland’s customer services, affiliates, agents or anyone else. The Player must read and unterstand them before using the Website. All notices under these Terms and Conditions are to be sent and received by email. For this purpose, Player notices should be sent to Customer Support. Lottoland will send its notices to the Player at the email address specified in the Player's Player Account. Lottoland may, but Players may not, assign any rights and/or transfer, sub-contract or delegate any obligations under these Terms and Conditions, and/or charge or deal in any other manner with any contract created under these Terms and Conditions or any of Lottoland's or the Player's respective rights or obligations. For the avoidance of doubt, Lottoland may transfer and assign any contract between Lottoland and a Player to any third party (including an affiliated company of Lottoland) in conjunction with the transfer of all or part of the business and assets of Lottoland. Any omission to exercise, or delay in exercising, any right or remedy under these Terms shall not constitute a waiver of that, or any other, right or remedy. The waiver by Lottoland of any of its rights or remedies arising under these Terms and Conditions or by law shall not constitute a continuing waiver of that right or remedy or a waiver of any other right or remedy.